On October 31, 1517, a German monk named Martin Luther nailed a list of concerns to the door of the church in Wittenberg. 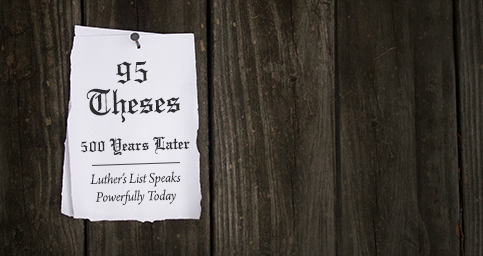 This list of concerns, now known as the 95 Theses, are widely credited with sparking what is now called the Protestant Reformation. Originally titled “The Disputation of Doctor Martin Luther on the Power and Efficacy of Indulgences,” the 95 Theses is now the common nickname. Luther certainly wrote these words to address a particular historical context and specific concerns about the Church’s teachings. Nonetheless, the truths for which he argues are compelling today and still challenge the tendencies of our hearts in our cultural and religious context. What follows is a direct English translation of some of Luther’s document with accompanying explanation of the context in which he first wrote these historic words and their ongoing importance for us today. Luther was convinced from the Bible that the true Christian life involved deep and sincere sorrow for sin and turning to Jesus in faith to receive his forgiveness. This repentance was to be the pattern and shape of the Christian life, not simply something done in a single act or purchased with a single gift to the church. Often today Christians are slow to acknowledge ongoing sin (instead being defensive or blaming others) and even slower to turn from it to Christ, even though we claim to believe the forgiveness found in him is true life. Luther saw in this practice a manipulative fundraising mechanism driven by desire for “gain and avarice” on the part of the church leadership. While it may have been successful at building new cathedrals, Luther insisted the Bible would have none of it in regards to the forgiveness of sins, since God alone ultimately dispenses forgiveness and determines men’s eternal destiny. Thus, Luther not only abhorred the sale of indulgences but also feared that the Roman Catholic Church and its priests were beginning to see themselves as above God and his Word rather than under that authority. In the modern-day church, we have witnessed no shortage of greedy preachers developing a cult of personality that demands money from followers. But while many of us haven’t experienced that close a connection to “indulgences,” we avoid intimate, direct relationship with God by neglecting his Word, prayer, and worship. One of the many negative ramifications of the Church’s teaching on the purchase of pardon for sin was the neglect of the poor. They didn’t have much for themselves and sometimes spent money they didn’t have to buy indulgences. And those with more money, rather than caring for their impoverished brothers and sisters, were lavishing gifts to build church buildings and purchase favor. Luther saw clearly in Scripture that this missed the heart of God and would incur his wrath rather than his favor. Self-promoting or self-serving use of God-given resources has remained an idol and a struggle in every generation. Giving generously and without expecting anything in return reminds us of God’s generous and gracious gifts toward us rather than looking for a personal benefit or kickback every time we give to someone. Luther was deeply concerned with the neglect of the Word of God. In fact, it became evident that this was the root of the doctrinal problems he had with the Church in his day. He believed that because they spoke more of their own ideas than they did of God’s Word, they were doing harm to their hearers. Luther was calling the Church back to consider what was most important. Having already critiqued the use of indulgences and purchased pardons, he now argues that the focus on these has neglected something significantly more important … the Gospel of Jesus Christ itself! Where is our passion for the Gospel? Have we at times become mere consumers of religious rituals, church ministries, and spiritual activities? Is a zeal for the preaching of God’s Word and the Gospel of Jesus Christ part of who we are? We must celebrate the good news of God’s grace both individually and corporately, in our homes and in our world. Once again, Luther saw the over-valuing of human ideas and relics as defaming to the truly valuable things like the cross of Jesus. Are there practices and traditions of men that we have allowed in our hearts to rise to the level of “sacred cows”? Luther warns us in every generation to preach Christ and him crucified above all other commitments. Luther concludes his list of concerns with the Church by comparing the priests to false prophets in Jeremiah’s day, who promised “Peace, peace” when there was no peace. They told the people of God they were safe and secure rather than pointing them to true repentance and faith in a Savior, who alone could make them safe. Luther knew that the promise of the Gospel was not of an easy earthly existence – as one may have been promised through the purchase of an indulgence – but he knew that exhorting Christians to cling passionately to Christ was the only way to give true assurance of eternal peace. Some today would critique those who suffer and urge that pain and heartache are not the path for Christians. Jesus says those who follow him will suffer as he did – and then enter into glory. At the same time, assuring people of eternal hope when there is no evidence of true repentance and faith is abhorrent. Luther ends his theses where he started: True Christianity is marked by ongoing repentance and desperate clinging to Jesus through the trials and tribulations of life. Please join us Sunday night, October 29, at 6:00pm, as we celebrate the rich theological heritage we have inherited from Luther and others in the Reformation at a Presbytery-wide worship service in the Southwood sanctuary.